Again a duo, and again a great one! It is indeed astounding how many good duos were coming from Poland in recent years. This time it’s a Polish/English duo with Rafał Gorzycki on drums and percussion as the Polish participant who is not only in Poland very well known and the likewise known Jonathan Dobie from Great Britain. Rafał Gorzycki made himself a name with projects like Sing Sing Penelope the Ecstacy Project, both with heavy influences on the Polish Jazz scene, while Jonathan Dobie already worked with familiar stars like Shoji Hano and Peter Brötzmann. 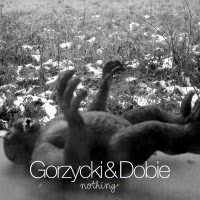 With this album Rafał Gorzycki rounds up his trilogy of duo recordings, after issuing “Experimental Psychology” (with Sebastian Gruchot on violin) and “Therapy” (with Kamil Pater, who plays the guitar as well). The result of this third part is a duo of particular depth and warmth. The album starts like the opening of a board game, in “Full of…” both musicians position their pieces. Despite of the partly harsh changes the track is characterised by high mutual respect, both receive all the time they need to make their turn. After that it gets a little more relaxed, the front lines are clear – also for the listener – and both start playing together. Their play is in songs like “Ballad for Joanna” and “Sooper Looper” particularly melodic. All in all this is one of the specialties of this album: although it’s obviously free improvisation the whole recording feels very harmonic. And a track like “Call it anything” even get’s kind of like a blues. Here Jonathan Dobie plays out his strength – he cultivates an personal playing style and follows a clear concept, he showcases his very individual language that might as in this case even sound bluesy. And with a congenial partner like Rafał Gorzycki this adds to something very enjoyable! And to round up the picture of the board game: At the end we have a draw, but one were not only both players win – but with them the listeners!